1.Your baby usually wears size S doesn't mean all size S will fit him/her. If your measurements are toward the upper end of the range given for a particular size,you may also want to choose the larger size, as you may also wish to do for heavily coated dogs to accommodate all that fur. Printed pumpkin hood：This cute smile face print pumpkin costume hooded will make your pet more adorable and add fun to the special day, get your pet involved in the entertainment you have at the festival. Fleece Material：The product is made of fleece material, It can be washed in a washing machine or washed by hand. It can be washed with warm water and mild soap, then air-dried and easy to care, keeping your pet warm, comfortable and warm throughout the day. Easy to Wear: This pumpkin hooded suit can be directly inserted, flexible, convenient and easy to put on and take off. 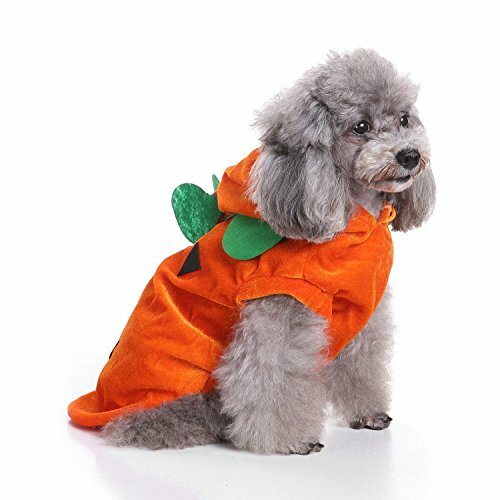 With a pumpkin hat to make your pet like a real pumpkin, a variety of sizes are available, please choose the right size and weight according to your pet. Dog's Intimate Clothes:Be a nice gift for your baby in Halloween, we are sure they will love it.Available for small or medium size pet.Suitable for Spring Winter or Autumn.Keeps your pet warm and cozy throughout any outdoor activity.It is suitable for Halloween,Thanksgiving Day, Easter Day,Birthdays, Weddings, Parades, Photo Shoot ,Weekend Parties etc.And add fun to the special festival. Notice:This dress has three yards:S: collar 9.84inch bust 14.6inch length 9.45inch, M: collar 11.8inch bust 16.9inch length 11.4inch, L: collar 13.8inch bust 18.9inch length 13.4inch.Please don't choose size according to your usual size,but to measure your pet's neck girth ,chest girth and back length and choose the correct size according to our size information in the description.If your pet is growing,please choose a size up. If you have any questions about this product by QIEKENAO, contact us by completing and submitting the form below. If you are looking for a specif part number, please include it with your message.